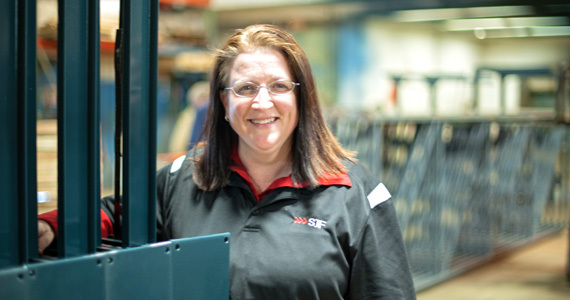 It’s been a few months since we’ve heard from our newest sales recruit – In this post, Rhonda Remer checks in with some insights on her 9 month anniversary in Material Handling Sales. Nine months is the typical gestation time of a baby. On my 9 month anniversary in Solution Sales, I’m happy to announce that I’ve been blessed with a little “Bundle of Joy.” No – I’m not talking about the birth of an infant, but rather something new to me called Repeat Customers! My general sales philosophy can be summed up in one statement. I want to make the buying experience for my clients as easy as possible. In supporting my customers, I pride myself on great customer service. I respond quickly when customers call or email, and I present the best option for their needs – often coming up with multiple solutions, each with benefits and drawbacks that the customer can then weigh on their own. If trouble or confusion ever arise, I take care of it promptly. Many years ago, in another lifetime, I worked for a Software company where the customer being pursued at that moment was the most important customer to the salesperson. Never mind the end user that had been paying maintenance fees for years. New customers were always given priority over existing customers. Although it may be the nature of the Sales world, I didn’t like the philosophy then, and I don’t believe in it now. When I get a call from a past customer, I prioritize their request to the front of the queue and address it promptly. Existing customers are very important to me, because we have a shared history. They have proven that they will do business with me and they were here first. That’s not to say that the new customers aren’t important, they’re just still an unknown quantity. If they give me their business, they instantly raise their esteem and become a priority going forward. Everyone’s got their own sales strategy and this is one of mine. Thanks for the insight, Rhonda – What do you readers think? Any thoughts on existing versus new clients? Do you prioritize one over the other? Why?